While Chris spent a few days working in Ohio, Oma spent a few days hanging out with Jane & Cam. Of course, when Cam and his grandma have any extended time together, baking and crafting are on the agenda. Oma makes certain her grandson finds all of the ingredients and completes all of the measuring for any concoction they make. For the first time, Cam made a delicious quiche lorraine with Oma. Who doesn't like a recipe that combines eggs, bacon and pie crust?! As an added bonus, we had a delicious breakfast for multiple mornings. Time with Oma is always special and Cam's parents are so very thankful for her extended duration to help out! On Wednesday evening, we had the pleasure of meeting Bexley, son of Katherine and Paul, just a little over a week old. He is so precious, handsome and sweet. Cam was very excited to see this new baby who he said "is like my cousin." We look forward to many adventures with Bexley and camping up north next summer! The weekend brought another exciting baseball game for Cam's team, the Lakers. The helpers were from Hope College and members of the Sigma Iota Beta sorority house. 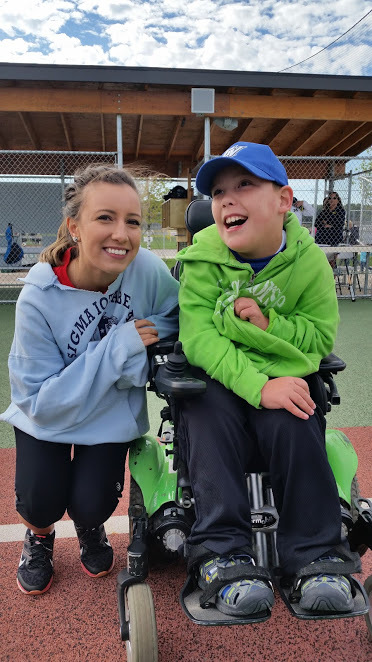 Cam's volunteer, Marissa, kept him talking in between the game action. Ms. Barbara from Meadow Brook was on deck to watch Brody and Cam make their plays. Karen, her sister Susan and husband Bill, also drove in all the way from Illinois for the 10am game which made for quite an early start on their end! Karen brought her newly adopted dog, Blossom, who garnered quite a bit of attention from kids and adults. Oma and Opa were in attendance too. With a crisp wind, we all settled in for a picnic lunch after the game. With sandwiches, fruit and chips, the only thing missing was some hot cocoa. Even though it was chilly, the company was warm and we were all grateful for the time together. Karen, Susan and Bill came over to Cam's house for a bit and the warm sun outside was a welcome sight. With the sun continuing to shine, Emma and Cam created a chalk city in the driveway filled with signs, Outside play combined with schoolwork- genius! The two buddies laughed and played for a few hours. On Sunday, our annual family photo shoot took place at the cottage for the very first time. We had planned afterwards to dine at a semi-fancy place in town but due to fall hours, instead we ended up at one of our favorite spots, Dog-n-Suds. No complaints from this crew! As we drove to the cottage on Sunday, the weather looked a bit bleak. However, the closer we came, the sun began to break through. We snapped this picture as we were turning onto Eilers Rd. Very reminiscent of the day Cam's parents were married. The sun broke through for the festivities. "Why did you not eat the cake yourself?"